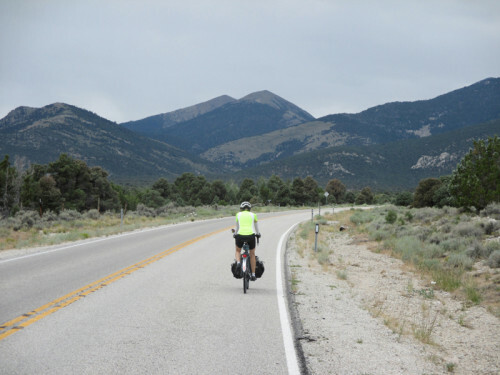 An ultra-cyclist, having crossed the entire state of Nevada, culminates the ride by climbing Wheeler Peak! Photo by Wayne Cottrell. The Great Basin Challenge is a 48.5-mile ride that explores Great Basin National Park in far eastern Nevada, near the Utah border. The Great Basin Desert is an arid expanse covering 190,000 square miles of Nevada, eastern California, western Utah, and southern Oregon. The National Park, which covers only a small, 122-square mile corner of the desert, is distinguished by its high mountains, the Lehman Caves, and bristlecone pine trees, the latter being among the oldest living things on Earth. Allow yourself at least four hours to complete the ride, because of an extensive amount of climbing. Start the ride in Garrison, Utah in the far west central part of the State. Garrison is an unincorporated community of Millard County, with a population of under 100. To get there, head south on I-15, exiting to U.S. Route 6, and then heading southwest through Eureka and Delta. Once beyond Delta, it is about 85 miles to the Nevada border along combined highways U.S. 6 and U.S. 50. Just before crossing the border, turn left and head south eight miles on State Route 159. Garrison is located at the junction between SR 159 and SR 21, both of which serve the community. 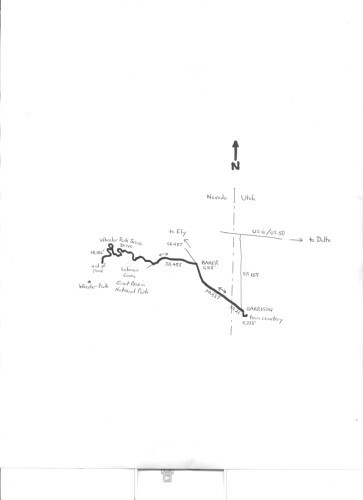 The proximity of these highways makes Garrison a convenient start-finish point for the ride. There are few facilities in town – the best place to park seems to be the town cemetery, located behind the community’s LDS Church. Enter the church from SR 21 via an access road, but continue past it, to the cemetery. Start the ride by turning right onto SR 21, and heading toward the Nevada border. SR 21 becomes SR 487 once across the state line, after a little over one mile. It is a swift seven miles to the town of Baker, in Nevada, from Garrison. While Garrison has no facilities, Baker has plenty, with lodging, eateries and mini-marts. Baker is a launching point for Great Basin National Park; the town (population 68 in 2010) is home to several prominent artists, and was even featured in a 1997 segment on The Late Show with David Letterman. Once in town, 7.4 miles into the ride, turn left onto SR 488, and begin the long climb into Great Basin National Park. The elevation at the turn is 5,326 feet (Garrison is at 5,279 feet). A sign indicates that the Lehman Caves Visitor Center is six miles away. The landscape along the opening part of the climb is nondescript, so ride on. After 4.8 miles of climbing, to 6,594 feet (5.0% grade), turn right onto Wheeler Peak Scenic Drive. You will miss the Visitor Center and the caves by turning here; a side trip is worthwhile, however. Wheeler Peak, at 13,046 feet, is the highest point in the park, and is technically the tallest mountain in Nevada. Wheeler Peak Scenic Drive advances toward the peak in a steady climb. Lehman Creek babbles to your left, while pinyon pine and juniper trees begin to dot the landscape. After passing the Lower and Upper Lehman Campgrounds, the road makes a sharp right-hand bend. Just beyond the bend, at the 14.7-mile mark (elevation 7,638 feet), there is a gate. This is closed from winter (usually November) until Memorial Day. From here, the road continues to climb in earnest, at an average grade of 8%, and with an occasional switchback, as it ascends to a gasping 10,186 feet above sea level. As you climb, you will pass through multiple ecological zones. At 8,500 feet, the pinyons and junipers give way to curl-leaf mountain mahogany trees, which are characterized by their waxy leaves and rough, dark appearance. At 9,000 feet, groves of conifers, including white fir, Douglas fir, and Ponderosa pine trees appear. Aspen trees, with their distinctive white bark, appear at 10,000 feet. The general rule is that each 1,000 feet of climbing is akin to traveling 600 miles north. At these high heights, the ecology is similar to that found in the Yukon Territory! Also, typically there is a 3o temperature drop for every 1,000 feet of climbing. Always check the weather before embarking on a trip into the mountains. Beyond the crest, the road continues for three-fourths of a mile, leveling off, and then descending gradually to a parking lot, and Wheeler Peak Campground. This is the end of the scenic drive. Circle the parking lot (do not enter the campground), and return to the main road. Wheeler Peak is another 3,000 feet up from here, via hiking trail. On a clear day, you should be able to spot a cirque (ice-filled depression) that is frozen year-round, in addition to stunning views of the surrounding Snake Range. Bristlecone pines, mentioned above, can be viewed in forests at Wheeler Peak. In general, the summit, pines and cirque are best viewed from trails that start at or near the road’s end. Otherwise, prepare yourself for a long and brisk, 16.8-mile descent to Baker! Once in Baker, it is another 7.4 comparatively flat miles to Garrison.